The Scholarship Luncheon is held in November on the Saturday before Thanksgiving. The event features a gourmet meal and professional entertainment. Club members sell tickets, organize gift baskets, and bake desserts to make this event a success. 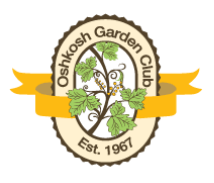 Monies raised at the Scholarship Luncheon enable the Oshkosh Garden Club to give two $1000 scholarships annually to qualified local students. Tickets for the 2019 Scholarship Luncheon are $25. Seating is limited and advance tickets are required. For tickets or more information, contact Mary Ellen Sedlachek at 920-426-1084 or redspark@milwpc.com.